As an engineer and entrepreneur, Harold Davis ’63 spent much of his six-decade career chasing technical dreams inspired by the goal of solving problems people said couldn’t be done. And for the better half of the past two decades, he dedicated a portion of his life to ensuring UNH students and alumni have the ability to do the same. 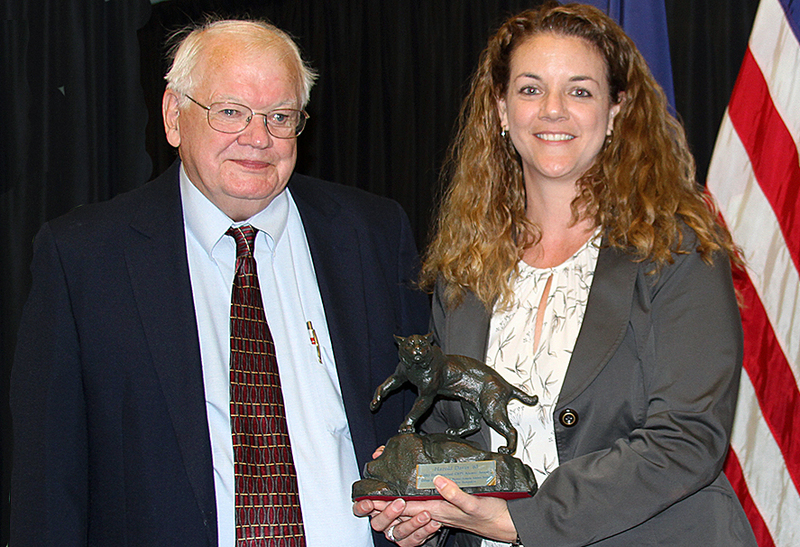 Davis’commitment to the UNH community is one of many reasons Davis was presented with the 2015 College of Engineering and Physical Sciences Distinguished Alumnus Award during a ceremony held October 16 in the Granite State Room. The annual award is given by the CEPS Alumni Society for outstanding contribution to society in the field of engineering, science, or mathematics with an emphasis placed on enhancing the image of UNH. Davis, who holds a degree in mechanical engineering from UNH, served two terms on the University’s Alumni Association Board and was a founding member of the CEPS Alumni Society. Mukasa marveled at Davis’ career, which spanned multiple pathways during a generation in which many engineers worked for a one or two firms. Davis holds more than a dozen U.S. patents covering things as diverse as a liquid nitrogen food freezing system to new concepts for septic systems. Upon graduating from UNH, he worked on steam turbines, cryogenic refrigeration, nitrogen food freezing, and other areas before eventually founding Wastewater Alternatives, Inc. The company, which has installed more than 1,500 systems in the New England region, was sold three years ago by Davis in order to enjoy his retirement. In addressing a room full of scholarship recipients, Davis expressed the importance of students mentoring young people to pursue engineering and to continue to give back to UNH and to inspire the next generation of engineers by mentoring young students.